Since some people prefer shiny user interfaces over command line, I have added web administration panel to auto uploader. 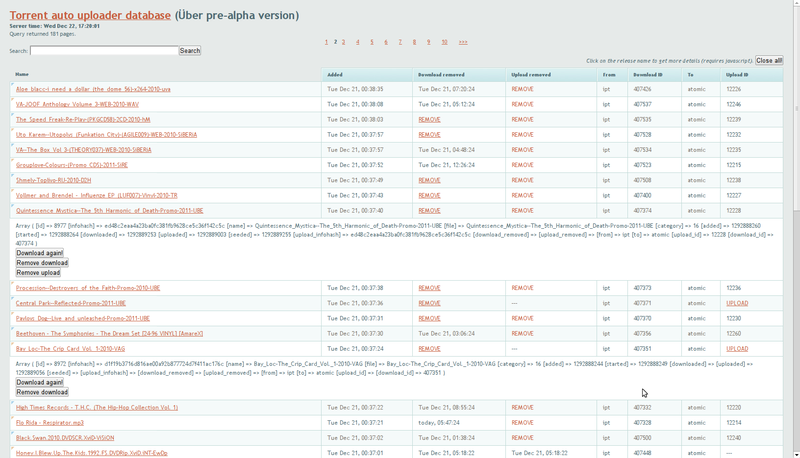 Since it is really early über pre-alpha version, it doesn’t have many options yet but it will change in time. The idea is to create admin panel that allows you to manage Uploader using only your browser and to forget about terminal commands. As you can see in the screenshot above, you can already search, remove, upload and redownload releases. Web panel is built using PHP and jQuery. To make it work, make sure you have installed Sqlite3 for PHP (it comes installed by default from PHP 5.3.x). You should be able to install it on Debian/Ubuntu by using sudo apt-get install php5-sqlite. 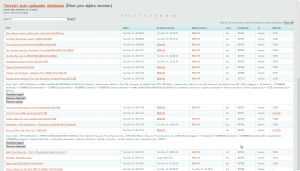 It is available through SVN repository, inside trunk/web_panel/. Nice job on the web panel bud :). As always excellent!!!! Thx, will keep upgrading it.